« What’s a Nimble Brain and Why You Want One. Last Saturday, during a Masters meet at Ithaca College, I swam the slowest 1000-yard freestyle of my life. It may have been as valuable a gift as any I’ve received from 45 years of competitive swimming. You see it provided perspective that will probably lead to almost limitless enjoyment of swimming—and competing—over the next 30 or more years,should I have the good fortune to swim that long. 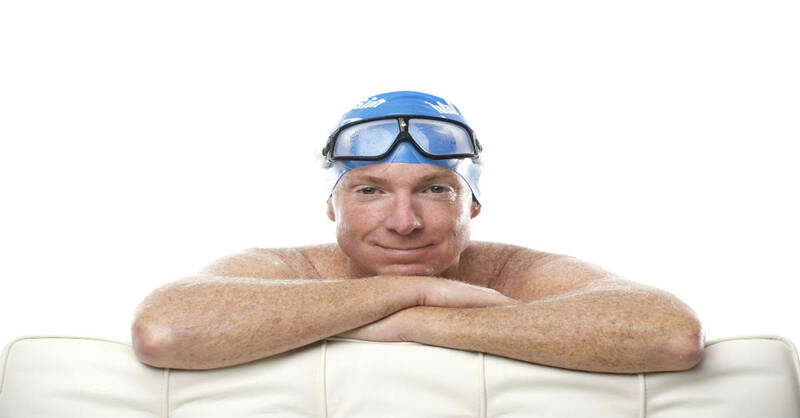 Perhaps the greatest challenge faced by Masters swimmers, at least after age 40, isn’t the difficulty of physically fighting back against the gradual slowing of one’s times with age—it’s being able to accept that inevitability with grace, and focus on all the positives that accompany being a goal-oriented athlete at a stage in life when many of your peers are easing off. For over four decades, the 1000 has served as a key benchmark because I’ve swum it more often than any other race. Between 1968 and 1972, I swam it nearly 50 times in college dual meets. That familiarity drew me to it when I joined Masters at 38. It also had more emotional resonance for me than other races, because, as a ‘mature’ swimmer, being able to approach my college times was a great source of pride. My lifetime record for the 1000 is 10:45, recorded in a dual meet in Dec 1970. But my speed that day was wildly improbable and even inexplicable (a story for another blog.) Most of those 50 swims fell between 11 and 12 minutes, shaped like a bell curve across four years of college. As a 17-year old freshman my best time was 11:59, after spending most of the season around 12:30. At 18 and 19 I swam consistently around 11 minutes. As a 20-year old senior, slowed by fatigue from overtraining, my times slowed steadily. By season’s end I sometimes struggled to break 12 minutes—a painful way to finish my once-promising swim career. I began swimming again at age 38, after a 17-year layoff. During the next few years, I improved my 1000 times steadily from 12:00+ to a Masters best of 11:23, my split for the final 1000 yards of a 1650 race at age 41, faster than some races I’d swum 20 years earlier. Swimming that fast went beyond satisfying; it even restored faith in myself after finishing college in such disappointing fashion. Between my mid-40s and early 50s, the pursuit of fast times took a backseat to developing TI as a method and business. I swam regularly, but used my pool sessions mainly as a laboratory to refine drills and skills in the TI curriculum. I swam often in open water races, but infrequently in pool meets. When I did swim the 1000 my times ranged between 12:30 and 12:50, which I considered respectable. At age 55 I decided to test the proposition of what ‘high performance’ could mean when I was well into middle age. As before, the clearest test would be how my time for 1000 yards compared to my younger days. The answer came in April 2006 at the Colonies Zone Championship when I swam 11:53 (neither shaved down, nor fully rested) a time that thrilled me as it was faster than I’d swum in 14 years—and nearly as fast as I’d swum 35 years earlier as a college senior. For several years after, I again reduced my emphasis on pool speed. I raced the 1000 once each at 56 and 57, recording times of 12:40 and 12:50, times I felt satisfied with considering my age and moderate training. A year ago, on the verge of turning 60, I couldn’t resist thinking about my familiar benchmark; four decades removed, how close could I come to my college times in the 1000? On January 23rd I swam the 1000 for the first time in over three years. When I finished and saw the digits 13:29 next to my lane I was deeply disappointed—both that it was the slowest I could recall swimming in 45 years and at how far out of reach my sub-12:00 standard seemed. Still, as always, I practiced diligently and purposefully and was gratified to swim the 1000 in 12:51 at Masters Nationals last April. Improving by 38 seconds in three months is a reason for celebration. Because I’d been somewhat slowed last year by a recurrence of rheumatoid arthritis, an autoimmune condition that leaves you feeling feverish and out-of-breath from exertion, I felt I could reasonably set my sights on swimming faster this year than last—and perhaps approach the times I’d done as a raw 17-year old college freshman. On Saturday, I mounted the blocks for the 1000 Free after having swum the 400 IM and 200 IM within a period of about 90 minutes. (In college, the idea of racing the 1000 following a 400 and 200 IM would have struck me as lunacy.) I thought my chances of beating last January’s 13:29 were reasonably good, but when I finished, the display read 13:42. What’s to be grateful for? Simply that I looked at those numbers and thought of them as—in the lexicon of engineers–simply a ‘data point.’ The digits on the board no longer had a grip on my emotions or how I feel about myself. They were simply an objective measure of how I swam on Saturday. On one level they fairly reflect the training I’ve done in the past two months, relatively leisurely, more focused on efficiency than speed. They also reflect that I’m a year older. But my most valuable perspective was to view them, essentially, as a math problem that I could spend the next several months solving, and from which I expect to derive many hours of enjoyment. By focusing on the math (deeper data points), I can set highly specific goals for improvement—save a few strokes here, a few hundredths of a second in tempo there–for practice between now and April. And throughout that period I will maintain unbroken focus on improving the data a tiny bit each day—as well as optimism that I can find a way to improve even more this season than last. I’ll be back in the pool today eagerly working on the solution to this season’s Math Problem. In my next post I’ll explain how I’ll use objective data from Saturday’s swim to sharpen my focus. Awesome post, as usual, and very timely for me. I just finished a meet where, at 44, while still nowhere near my college times, I managed to simultaneously record Master’s best times (beating swims from 4 and 6 years ago) AND exit the pool MAD at myself. It took a lot of frank talk from my wife to help me put these swims into perspective and to ‘get happy’ with the swims by the end of the weekend. By last night, I was ‘at one’ with my swims and pretty joyous at being able to still compete at this age. Your post today put this even deeper into perspective and has me looking ahead to, hopefully, my next 30 to 40 years of racing … each year, each race bringing new things to learn about the sport and myself. Before you go into the water, ask yourself how this is going to make you happy. With 41, that has helped me accept time measurements but also greatly restored the joy in (competetive) swimming I’ve once had as a junior. In other sports, I’ve come out of weekends uterlly devastated by my “under-performance” be it running, kite-surfing or whatever. In retrospect, I had wasted precious life hours there by not asking “before I start, how will this make me happy?”. I ‘m 54 and started swimming in September after a 16 year hiatus. My niece, who is a swim instructor at a YMCA, suggested I look into TI after I asked her for some tips on swim workouts. What a great tip! Tonight I swam my first uninterrupted 1500 yards (in ca. 30 minutes). Did 2 more two-hundred yard sets to make it a mile. What’s wonderful for me is that a couple of weeks ago I could only swim 50 yards before i had to stop to catch my breath. I could even swim a mile total but only in 50 yard chunks. Now, after reading posts and watching your videos, I’ve got some basics down both with breathing and with keeping a lazy leading arm. Focus on these skills enabled me to swim uninterruptly, first for 600 yards, then 900 yards, and now 1500 yards. Am looking forward to building up to a weekly workout of 6,000-7,000 yards. But I’ll do it slowly, a little at a time. Maybe someday I’ll have the chance to do a 1000 yd, open water swim. Thanks for sharing your experience and knowledge coach; your thoughts are very inspirational and motivational to me.